Readers will note the USSR squad is comprised of skaters exclusively from the four Moscow-based clubs in the Soviet elite league whereas Czechoslovakia have eight different clubs represented from their top domestic circuit. 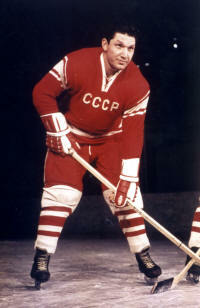 BORIS ALEXANDROV, who did not take a single shift for the Soviet Union in the Innsbruck finale versus Czechoslovakia, was the only ice hockey player from Kazakhstan to ever appear for the USSR at the Winter Olympic Games. For the world-wide audience, it would have been difficult to know that the Sapporo Games would be the last for the man referred to as the Father of Soviet Hockey. But, alas, despite another successful run to the gold medal, the 1972 Winter Olympic Games marked the end of the line for a legend in the USSR. Not before, however, Soviet Union national team coach ANATOLI TARASOV had the chance to chalk up a third Olympic championship. 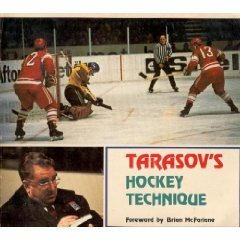 An integral part of hockey in the USSR since the country had been playing the sport seriously, Tarasov actually had led the Soviet elite league with 14 goals for air force club VVS MVO Moscow that inaugural 1946-47 season. The next winter, the 29-year-old forward transferred to CDKA (later CSKA) Moscow to become the player-coach of the army club. 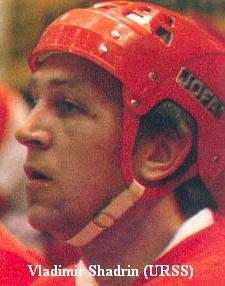 Tarasov, who ceased playing after the 1952-53 schedule, remained rooted behind the bench for CSKA until the conclusion of the 1974-75 campaign. 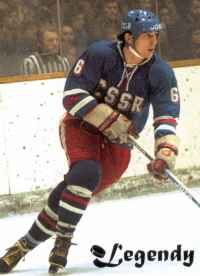 Tarasov, whose first Olympic adventure ended with a bronze medal for the Soviet Union at Squaw Valley in 1960, totaled 22 wins and two ties from 27 games at the Winter Olympic Games for the USSR. A pay dispute led to Tarasov’s dismissal as the national team coach shortly following the 1972 Sapporo Games. Soviet hockey players received not only gold medals from International Olympic Committee officials, but cash bonuses from USSR authorities, as well. Tarasov felt that the time had come for coaches to collect a monetary reward, too. 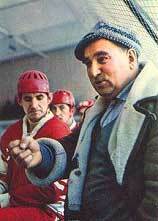 The officials in the Soviet Ice Hockey Federation, if not those in the Politburo, as well, disagreed. A 5-2 defeat of Eastern-bloc rival CZECHOSLOVAKIA at Sapporo in 1972 clinched a third successive Olympic title for the SOVIET UNION. 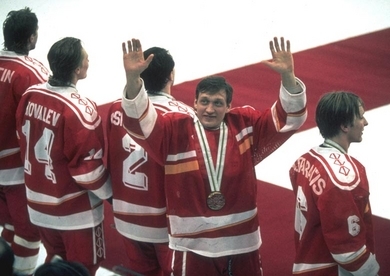 The triumph resulted in a fourth set of gold medals for the USSR national ice hockey team in only five trips to the Winter Games. 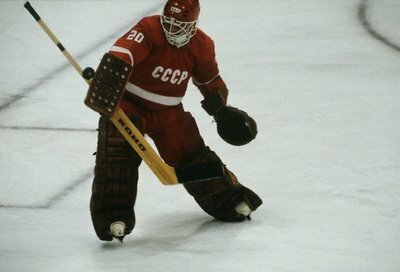 Whereas the 19-year-old USSR goaltender VLADISLAV TRETIAK pocketed his first-ever Olympic gold medal in Japan, three other veteran Soviet internationals became champions at the Winter Games for no less than a third time. High-scoring CSKA Moscow left wing ANATOLI FIRSOV (30) in addition to CSKA Moscow defensemen ALEXANDER RAGULIN (30) and VIKTOR KUZKIN (31) as well as Dynamo Moscow rearguard VITALY DAVYDOV (32) accomplished that which no other ice hockey player has been able to surpass since. The four skaters competed on three Soviet teams which compiled a record of 18 wins against but one loss and a single tie at the Winter Olympic Games from 1964 thru 1972. Trailing by a goal with but twenty minutes to play in their final match against Czechoslovakia at the 1960 Winter Olympic Games, coach JACK RILEY’s United States squad greeted an intriguing guest between periods at Squaw Valley. 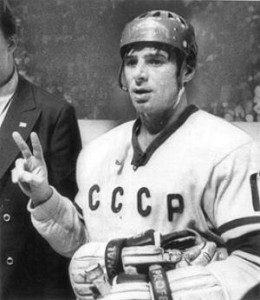 The captain of the USSR national team, NIKOLAI SOLOGUBOV, arrived and, unable to speak English, began to employ hand signals in an effort to provide aid to the Americans. The 35-year-old CSKA Moscow man was suggesting that the U.S. skaters, in the altitude of the northeastern California mountains, should take oxygen. Although at first unable to understand, the Americans ultimately were able to secure an oxygen tank and accept Sologubov’s advice. 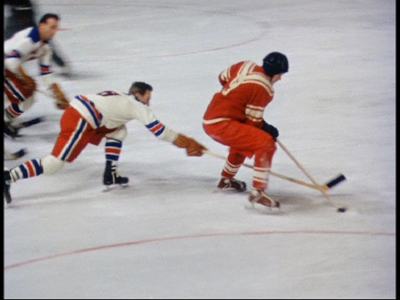 The United States, suitably refreshed, stormed back with six unanswered third period goals to down the Czechoslovaks, who took no oxygen, 9-4. Some say Sologubov appeared in the spirit of goodwill and sportsmanship that is part of the Olympic ideal. Not to discredit the Soviet captain, but the theory is shaky at best. 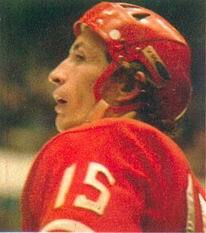 The USSR, standing on five points, were set to play a powerful Canada later in the day. Meanwhile, the Czechoslovaks, having four points, could have moved ahead of the Soviet Union with a victory over the United States. Ultimately, both Eastern European rivals lost on the final day — this left the USSR with the set of bronze medals. If VYACHESLAV FETISOV was the Soviet answer to BOBBY ORR, then NIKOLAI SOLOGUBOV, if not quite as rough, was certainly the USSR’s version of EDDIE SHORE. 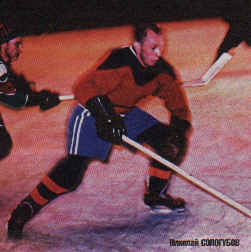 The original offensive threat from the Soviet blueline, Sologubov (5 ga, 1 go 8 as, 9 pts) earned his third career selection for Best Defenseman by the International Ice Hockey Federation Directorate at the 1960 Winter Olympic Games at Squaw Valley for the bronze medalist from the Soviet Union.